Information shamelessly poached from and Copyright 2000, Krusse International, an eBay Company. Car was repainted in the original BMW amazonasgrun color when owned by Mrs. Onassis. Leather is original in good condition with 3 tears on drivers seat. Mrs. Onassis had the engine rebuilt once after it overheated in New York City on the F.D.R. Drive. The car drives beautifully. 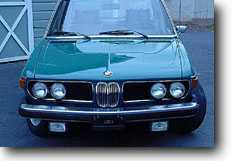 The car is a green BMW Bavaria 3.0S 4 Door Sedan with tan leather interior equipped with automatic transmission, which Jackie Onassis drove during 18 years from August 20, 1974 date when she purchased the car from Martin Motors BMW on the upper East Side in New York until 1992 when she sold the car to her neighbor in Peapack. Mrs. Onassis bought her BMW new, while married to Onassis who purchased a country estate for them in the horse country of Peapack-Galdstone New Jersey. It was in this automobile that she would drive her children each weekend to Peapack to go riding and fox hunting at the Essex Hunt Club. During the week the car was garaged in a parking garage on 86th street but she occasionally used it to fulfill editorial commitments at Doubleday. As noted by her son his mother had a "love of words, the bonds of home and family and her spirit of adventure" the BMW was her principal means of travel to do all three. "It was her only and favorite drive" says her Peapack neighbor. "When she finally decided to part with it I purchased it and put it in storage with my collection." The highest bidder will get the car, the original title dated and signed by Mrs. Onassis in 1992. Also available a set of 6 framed photographs featuring her driving the car around Manhattan and even getting a parking ticket for double parking on 5th avenue.